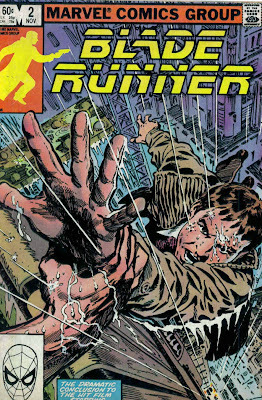 In October of 1982, Marvel Comics released "the official comics adaptation of the hit film" Blade Runner, directed by Ridley Scott. 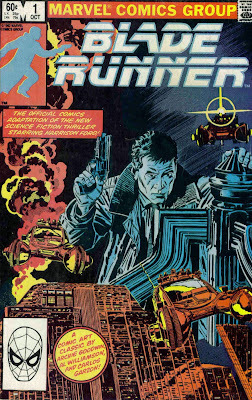 Setting aside the crazy marketing hyperbole (because Blade Runner was not a hit film at all on release in the summer of 1982...), I've always found this two-issue adaptation of the tech noir classic to be one of Marvel's finest movie-to-comic efforts. 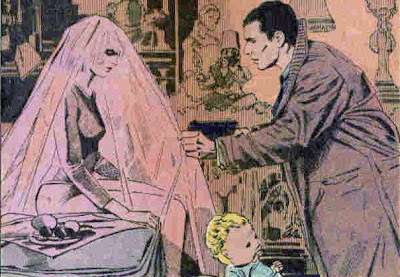 Adapted by Archie Goodwin and drawn by Al Williamson and Carlos Garzon, the comic version of Blade Runner evidences an unusually high-degree of fidelity to the film's visuals If you've seen Blade Runner (and I assume you have...), you understand immediately why that's so important. Blade Runner creates a distinctive mood and texture through its imaginative (yet wholly believable) visualizations of a future "dark city." Just ponder Blade Runner for a minute, and your mind will fill with indelible images of incessant rain; neon signs, vast "talking" billboards on the sides of incredible skyscrapers, flying cars and the like. From the gleaming, smoking cityscape of the future, to the palatial penthouse of the Tyrell Building, Blade Runner proves itself one of the most visually unique and accomplished science fiction efforts in the cinema's history. Marvel seems to get that; it takes precious few liberties with the film's aura or production design. One pertinent example: Marvel is the outfit that could never quite get the look of William Shatner's Captain Kirk right in Star Trek; but the artists here do a bang-up job of making Rick Deckard look exactly like Harrison Ford. Indeed, all of the likenesses to the cast are eerily, commendably good. A good comic-book adaptation of a film doesn't just live and die by the visuals, but also by the way it successfully opens up a story we've experienced already; thus showing audiences something familiar and different at the same time. Here, again, I find Blade Runner quite an achievement. For instance, during one of the film's exposition-heavy early scenes (involving Deckard and his boss, Bryant), the comic-book actually cuts to images of the information/data Bryant is relating about the escaped Replicants. When Bryant describes Roy Batty's history ("They used Roy Batty in every off world conflict in the last three years. He'd flown Gypsy ships with the Russians at Tannhauser Gate and been with the squadron of Night Timers in the wars near Jupiter..."), we see frames of burning spaceships, in planetary orbit. It's just one more way to open up Blade Runner's world, but a powerful one. I remember when I first saw the film thinking about the incessant advertisements (carried on blimps...) for life "off world." That idea carried such import for me: who would stay behind in this overpopulated, nihilistic world? And what kind of life did the "off world" promise? Well, obviously someone at Marvel thought about that too, and inserted this nice little explanatory frame about Batty's outer space exploits as a "super soldier." On the downside, the Marvel comic includes the theatrical version's hammy voice-over narration (though it reads better on the page than it did on the screen), as well as the sort-of-unbelievable ending sequence featuring Deckard and Rachel heading off to a natural northwestern paradise (really left-over stock footage from Stanley Kubrick's The Shining ). As I recall Al Williamson did an equally brilliant job on the "Empire Strikes Back" comic adaption, I remember getting that when I was as young as 5 and loving the artwork. One thing I've always admired about Williamson's work was his repect to the designs and details of the films being adapted (and yes, as mentioned above, his work on the Empire Strikes Back adaptation was also brilliant). There was nothing more annoying than an adaptation that looked nothing like the movie. I was often pleased with his work. I often wondered if the film company provided him with production still for reference material. He took minimal liberties with the visuals and went for a dry, straightforeward look. Often they were poorly done "Cliff Notes" versions of the films. Hats off to Mr.Goodwin for not only doing the Bladerunner adaption rather well, but doing so in only TWO issues. 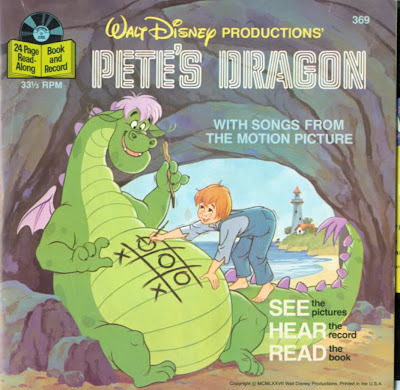 Most adaptions were at least three to four issues long. Makes you wonder if Marvel wanted to cash in, but with little financial risk. Have you considered a piece on the adaptation of Dune? TV REVIEW: Fringe: "The Cure"
TV REVIEW: Fringe: "Power Hungry"
CULT TV BLOGGING: Quark Round-up! Muir in View Magazine discusses... Chucky!